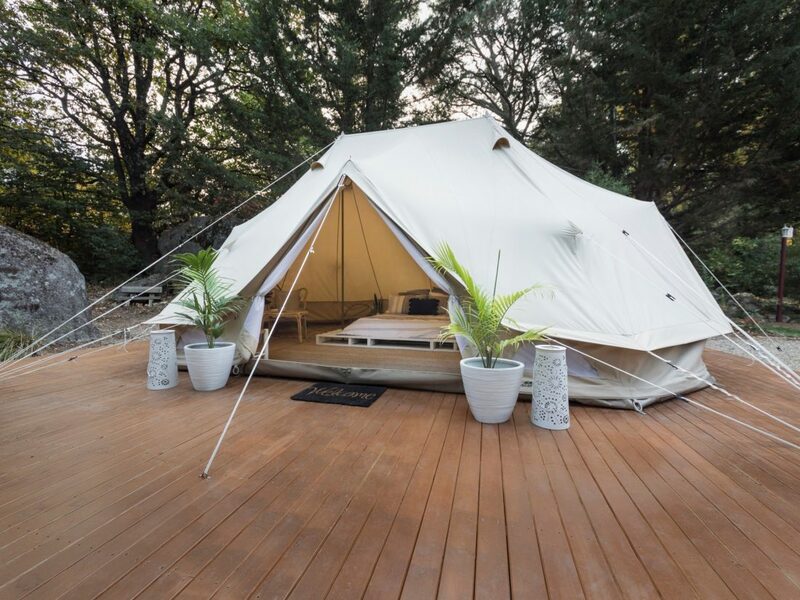 Into the Woods Glamping stays are a unique accommodation experience for people looking to get back to nature. Nestled within beautiful evergreen trees at the foot of Yackandandah creek thespacious six meter Emperor tent provides the luxuries of home while keeping the camping experience that takes you back to your childhood. Included in your stay is: a queen size innerspring mattress, Morgan and Finch linen, Delonghi Heater, a kettle with tea, coffee and milk, boardgames, a wireless speaker, outdoor and indoor chair settings and towels. The Emperor Tent is on a fixed site in Yackandandah. No extra site fees are required to be paid. Your tent is complete with; a queen bed, lighting, wireless bluetooth speaker, fan and heater, towels, lantern, board games, magazines, kettle (with tea and coffee), indoor table setting, and outdoor chairs.